Commercial chimney cleaning is recommended annually to remove debris and dirt that accumulates naturally from weather deterioration and from animal nests in the chimney flue. Regular chimney maintenance and cleaning will also help improve heating efficiency and safety. Call 1-516-279-1513 to schedule commercial chimney cleaning service or request a Free Commercial Chimney Cleaning Quote. The slightest amount of soot accumulation in a chimney is enough to cause a chimney fire which can damage the chimney and spread causing more serious problems. We are committed to providing clients with the highest level of quality service and guarantee every job is done properly. 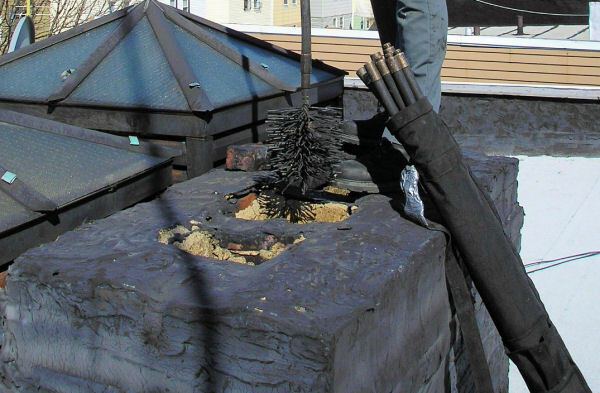 Our chimney cleaning services are designed to accommodate a wide range of clients in New York including commercial buildings, apartment buildings, condos, Co-op buildings, homeowners associations (HOA), and brownstones and we are committed to providing clients with the highest level of quality service. For commercial chimney cleaning service, call Chimney Repair NY at 1-516-279-1513 or request a Free Commercial Chimney Cleaning Estimate. We are a full service Commercial Chimney and Masonry Company that specializes in commercial chimney cleaning, brickwork, and chimney maintenance for Manhattan, Long Island, Westchester, Brooklyn, Queens, Bronx, Nassau County, Suffolk County, White Plains, and Yonkers, New York. Call us today 1-516-279-1513 for more information about our commercial chimney cleaning and chimney maintenance services.